White or Kraft Folding Gift Boxes are an economical way for your customers to pack gifts. 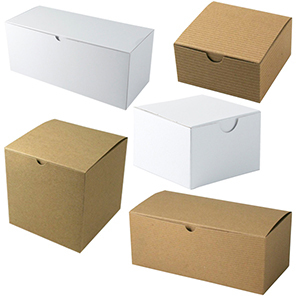 We offer 30+ styles for both White and Natural Kraft Folding Boxes. Not only are these easy to use, they also ship & store flat allowing you to save room and pay less for shipping! American Retail Supply offers White & Kraft Gift Boxes in 2 styles, One Piece Folding and 2 Piece Locking Gift Boxes. Tinted Kraft Tuck-In Gift Boxes are beautifully colored boxes that are a great option to pack your products or gifts in. We offer the Tinted Tuck-In Boxes in 4 colors and 12+ sizes! All Tuck-It Boxes are sold in cases of 100 unless noted otherwise. Add a personal touch to each box, thanks to our hot stamp options! If you are looking for a smaller Gift Box option, Pillow Packs are perfect! Pillow Packs are available in Kraft and White and feature easy to open ends for a unique packaging experience. Pillow Packs are and ideal choice to pack small miniature gifts, jewelry, chocolates and other small gifts. Make each Pillow Pack extra special with one of our many Gift Bows. Pillow Packs are sold 250 per case, unless stated otherwise. 2 Piece Hat Boxes come in 4 different sizes and have a low gloss white finish board with gray interior. Each Hat Box also features a polished white cord handle, making it an ideal choice for boutiques, hat stores, gift shops and more! Each 2 Piece Hat Box is sold in a case of 25, unless stated otherwise.